Cocoa grows on Cacao trees within approximately 20 degrees to the north and south of the Equator. 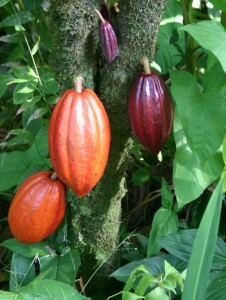 The immature pods show a variety of colors, usually green, red, or purple; and then tend towards yellow or orange as they mature, especially in their creases. Once picked, the pods are cut open to extract the seeds which are left to ferment (or “sweat”) for several days. After the fermentation period is complete, the beans are dried and packed in burlap bags for shipping. 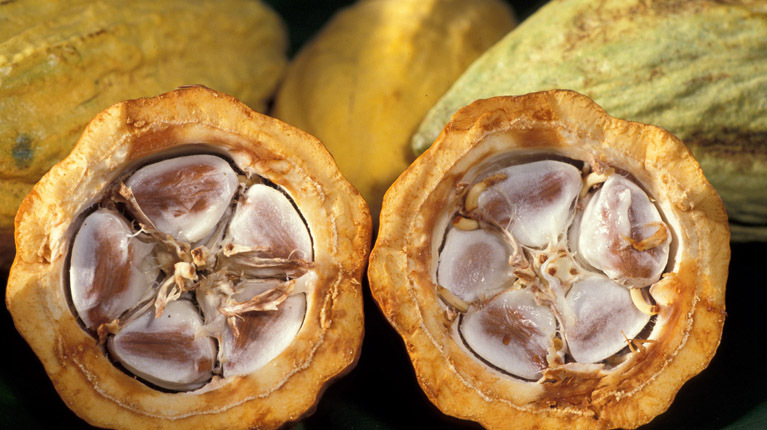 The cocoa beans are then processed into cocoa powder, cocoa butter, baking chocolate and/or dark and milk chocolate. Chocolate and cocoa are rich in flavonoids, specifically epicatechin, which may have beneficial effects on cardiovascular health.